Marcus Mariota to the 49ers? It Makes Sense. San Francisco certainly didn’t have the season they were expecting in 2014. Not only did they miss the playoffs, but they finished third in their division and were forced to fire their head coach who, just two years ago, took them to a Super Bowl. 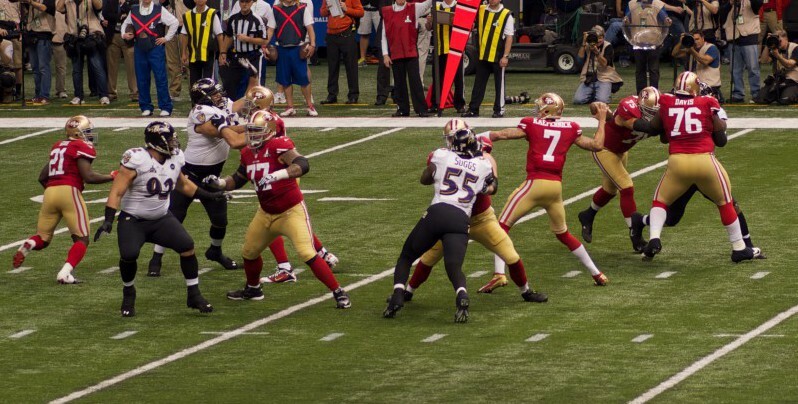 Although there were a lot of shoulders on which to place the blame, one of the strongest cases to be made was the weak performance of QB Colin Kaepernick. The third-year starter seriously regressed in 2014, seeing a decline in his yards per attempt numbers and touchdowns, while still throwing more interceptions than he did in 2013. When all was said and done, Kaepernick ended up leading the 49ers to the league’s 30th best passing attack, just barely edging Jacksonville and the Jets for last place. With all the weapons at Kaep’s disposal, that’s simply unacceptable. Management already fired Jim Harbaugh, so why stop there? This team needs a change of direction, and Marcus Mariota is the man for the job. SF Trades: Kaepernick, 2015 first, 2015 second, 2016 first, 2016 third and 2017 second-round picks. If you’re Tampa Bay, what’s not to like about this? They get a proven QB who, although not excellent, has shown signs of greatness. Kaepernick’s dual-threat capabilities make him a match-up nightmare, and the thought of him and Cam Newton squaring off twice a year down in the NFC South is tantalizing even for the average football fan. Plus, on top of solving the Bucs’ QB problem, they get an added four picks to help boost their roster. For San Francisco, this is a must. There’s simply too much talent out West for the 49ers to have another season watching the playoffs at home. Mariota is simply a better version of Colin Kaepernick, both mentally and physically. A lot of the controversy surrounding Kaepernick was his inability to learn the playbook fully, which is certainly never going to be a problem with Mariota. Also, as an added bonus, with Mariota joining the squad the 49ers might finally have a use for LaMichael James on offense. In theory, he should excel. The 49ers are loaded with weapons, highlighted by Vernon Davis, Michael Crabtree, and Frank Gore. Although this is a team getting older each day, both Gore and Davis had down years and will be looking to rebound. Crabtree, when healthy, is one of the most dangerous receivers in the game. Also, the 49ers still have Anquan Boldin who would be a reliable receiver while Mariota adjusted to the 49ers’ west coast style offense. Combine those four with the young talent of Bruce Ellington and James, and the 49ers have a pretty formidable offense. It also helps that the 49ers just built a brand-spanking new stadium in sunny Santa Clara with deluxe facilities (however it will still probably be a downgrade from what Mariota had here). With Mariota running the offense, the 49ers could see a major shift in productivity. It all depends on how willing they are to pull the trigger. Unless the 49ers signed a veteran QB, yes, he would. The only backups on the team are Blaine Gabbert and Josh Johnson, neither of whom are going to lead a team to the playoffs any time soon. Mariota’s a dedicated student and a quick learner, so I’m not worried about his ability to pick up an offense quickly. Also, luckily for him, the 49ers don’t start division play until later in the season. The NFC West’s defenses are the scariest in the bizz, so the more time before having to play against them, the better.